Giveaway: A Pair of Bohemian Chic CJane Earrings. Shown Below. CJane has named her the nicest woman on the planet. No arguments here. Crystal is the mastermind behind all sorts of handcrafted jewelry and other items. She loves making things out of old treasures and is inspired by junk, her garden, foreign movies, and creative people. She is also the designer of the best selling "All is Well" necklace. When considering a piece for CJane's Soiree she had a brillant idea. She worked with Ellen Switzer, of CJanes' Ellen Switzer Project and designed the perfect piece to match the postpartum house dresses Ellen is making Courtney. Wait until you see what she has done. Wait for it. Wait for it. CJane will receive THIS custom necklace and set of earrings. Want to get closer to CJane,...by wearing her earrings. Leave a comment on this post telling me what Crystal B piece you wish was named after you. I am now following CrystalB. :) ! I love the Collier Je T' Aime necklace... PLEASE! Can I enter this even if I DO have a lovely pair of earrings named after me in Crystal's shop? Because I am lucky enough to know Crystal and she is lovely and nice and fun to boot! The Mrs. Nielsen necklace. Can you say beau.ti.ful.? I love the Fleur Goutte - Mademoiselle Olivia earrings...gorgeous!!! I love everything! But especially the collier je t'aime. I LOVE Collier Coeur - Forever, and would love for it to be named after ME! 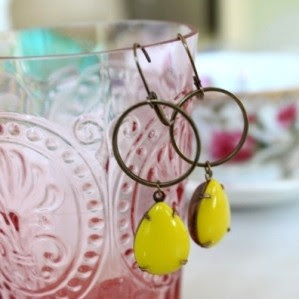 I'm quite a fan of the bohemian yellow, Mrs. C earrings myself. The Madame Hunter earrings are perfect! i love them all. seriously so hard to pick. if i had to, it woujld be Fleur Goutte - Mademoiselle Olivia. Madame Dicksa...I love love love it! I love the Madame Sutton earrings. I love the Collier Madame Tingey necklace! I love the Fleur Collier - Madame Tanner necklace. Beautiful! I wish the Petit Goutte - Madame Beesley earrings were named for me. So perfect. I love the Petit Fleur Gouttelette - Madame Warren earrings. Adorable! I love CrystalB & own the All is Well necklace. Honestly, as cheesy as it sounds, it gives me such comfort when I wear it! I wish the Petit Fleur - 108 earrings were named after me. So simple, pretty & such a lovely orange/pinky color. Not to steal Lucy's thunder, but I wish the Madame Lucy earrings were named after me. Slightly below the radar, classic, and intricately beautiful! Petite Gouette - Mrs. Rasmussen. Simply chic! Petit Fleur - Grand Mere Dawe- Lovely!!!! Love the Petite FLeur number 7. I just got some of you earrings from my sister and I love them! I love wearing earring, they are my favorite accessory. I wish the Bohemian Boucle were named for me because I would wear them all the time if I had them! I love the earrings that are called petite fleur Madamoiselle Sophia. If they were named after me I would love it! Petit Fleur 108...darling floral earrings. Loved the Bohemian earings pictured above. Madame beesley all the way! I'd pick the Fleur Collier - Madame Marshall necklace as the item I'd want named after me. I love it! I love the Petit Fleur Gouttelette - Madame Warren! I love them all!!! The Mademoiselle Olivia are so pretty! The 'Keep Calm and Carry On' necklace has been on my wish list for sometime. I would like this named after me.....my husband calls me his English Rose.... appropriate for this necklace. The Petit Fleur Goutte - No. 110 is so beautiful! It would be an honor to have this creation named after me. The Mademoiselle Olivia of course. They're gorgeous! The Petite Goute- Mrs. Rasmussen. I would like the Petit Goutte earrings named after me because I love purple! I love the Lucy earrings...too bad they're already perfectly named! The Vintage Reclaimed - Nettie. I am always in that color blue. They are so pretty. Bohemian Yellow earrings are my favorite. Definitely my favorite. I love that yellow color . . . and flowers! The colors are my fave and they are just plain lovely. I like the Petit Fleur Gouttelette! I like the Petit Goutte - Pluie . Ooh- I LOVE all the Petite Fleur pieces- but I think my favorite would be the Petit Flour Goutte with the little sparklies. i LOVE the necklace cjane is receiving - i would rename it please be mine!! I would have to say the necklace that Cjane is getting. I love the flower with the dove. The Bohemian Boucle earrings in Rouge are lovely! i am a big fan of the cjane earrings. they're beautiful. She should rename the Ms. C after me. Love them! Petit Fleur No. 7 earrings - so sweet. Mrs. Rasmussen...classic vintage pearl, just lovely! The bohemian chic, cjane ones are my total favorite! the Lucy's and the Olivia's are wonderful!! Petite Gouette, of course, cuz I'm only 5'0" and my fav color is green!! Petit Fleur Goutte - No. 110 because most of my family members call me Rose. I love the Petite Goutte - Luella! Although they are all beautiful! Sorry CJane - I'm wishing the Bohemian Chic were called Karen. Couture Collier all the way. In green. I'd love it to be named after me! Why not???! The Petit Fleur Gouttelette - Madame Warren. They are so pretty. Pettit Goutte - Madam Sutton! Sutton to Sera works, right? I'd love to have the Couture Collier Vert named after me. Love it! I got a necklace for Christmas from crystalb from my hubby who loved that it was packaged so beautifully that he did not need to wrap it! I love these earrings: Petit Fleur Gouttelette - Madame Warren. I'm in love with the Collier Mrs Nielsen. The Mademoiselle Olivia earrings should be re-christened "M Rebecca's Ornaments". I love the Fleur Goutte - Mademoiselle Olivia! I love those colors together! I've been wanting the nie nie necklace for a while now. The cjane pieces are beautiful. Love the Fleur Goutte - Mademoiselle Olivia! Louella or Madame Sutton. Love those! I think the Madame Marshall necklace should be named after me...I covet it! 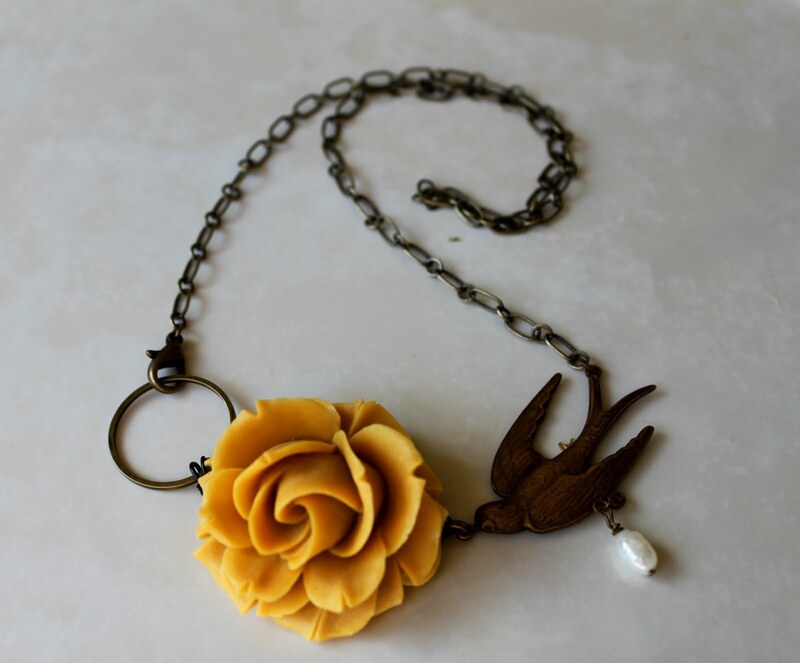 The yellow rose necklace is divine. Did I mention I'm from Texas? It's a toss up between the Vert and Mrs Walton. I will have to buy one of these. Maybe both. I would want the Couture Collier - Vert named after me. My favorite color & suits my style! 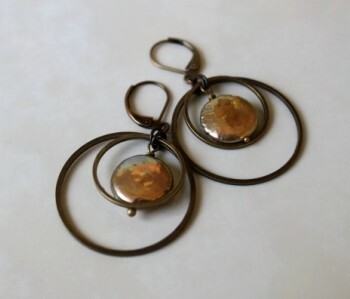 The Vintage Reclaimed-Nettie earrings! Love them! Actually I really love the Bohemian Chic Cjane earrings. Really! Although they're all beautiful. Instantly fell in love with Madame Sutton--my grandparents used to have dishes with a similar print, and it took me right back to their house! The Mademoiselle Olivia should be re-christened "M Rebecca Ornamental"
The earrings are gorgeous. In particular, the Mademoiselle Olivia earrings seem to be calling my name. I have the FV button on my blog! Love the Collier Miss Klc - that could bear my name! I LOVE CRYSTAL B!!! That necklace you are getting, I need that! I want that one named not after me, but after my daughter, Lola! LOVE anything and everything of hers and follow all three of her blogs! I'd name the "peaches" earrings after me. They are my favorite color AND I wear my pair of them ALL THE TIME!! I love the Olivia earrings! The Madame Johnson earrings really should bear MY name! Love 'em. I love them all, but would go with the Bohemian Yellow! Olivia earrings!! love love loveee!! Petit Goutte - Madame Beesley should totally be named LibraryGirl fabulousness!